The actor Cary Grant once said of acting that, “It takes 500 small details to add up to one favorable impression.” That’s true for writing as well—concrete details can paint a picture for a reader and establish credibility for a writer. Details can be tricky, however, and in the swirl of research and the dash of exposition, it is possible to get things wrong: dates, names, quotes, and facts. I’ve been doing some fact-checking of my own lately for a book project and have a few tips. If you don’t know, don’t assume. Is guerilla originally a French word or Spanish? I once assumed it was French, not bothering to check. But it turned out to be Spanish. Don’t be misled by terminology. I once referred to the Soviet Revolution as occurring in October of 1917, based on the notion that it was the October Revolution. But that’s only true on the Old Style calendar; on the New Style calendar, the revolution took place in November 1917. Beware of common knowledge. What we think we know may not be the whole story. Take the simple statement that Johannes Gutenberg invented the printing press. He was involved, to be sure, and a key player. But he was not a lone artisan (he had financial backers supporting him and skilled craftsmen working for him) and it is more accurate to say that he devised a revolutionary method of printing with mechanical movable type. Learn what needs checking. For any project, keep a list of the kinds of things that need to be verified: names, dates, places, arithmetic, and more. Names shift in your memory: Is it Pacific Crest Trail or Pacific Coast Trail? Dates can lead you down a garden path—a film might have been produced in one year and released in the next. Someone elected in 1980 would have taken office in 1981. A bridge or building you mention might not have existed in the time period of your novel. Information mutates from source to source, so it is preferable to find the original source. Where that isn’t possible, look for the best source possible—something that is peer reviewed or fact-checked. The arithmetic of lifespans can be tricky as well: If someone was born in 1894 and lived until 1976, how old were they when they died? Eighty-two is what you get by subtracting 1894 from 1976, but the actual age depends on the birth and death days: December 15, 1894 and February 20, 1976 yields eighty-one and change. Look for original sources. Information mutates from source to source, so it is preferable to find the original source. Where that isn’t possible, look for the best source possible—something that is peer reviewed or fact-checked. Ask for help. Reach out to librarians, archivists, and other scholars. When I found myself stumped about a particular fact whose citations all pointed to one place, I contacted the author and he helped me resolve the mystery. Admit defeat when necessary. When you’ve determined that something is unverified or in dispute, say so. There’s no shame in being uncertain. Inevitably, you will make a mistake, misread a source, or get fooled. When that happens, someone will correct you and it is best to admit the error, say thank you, make a correction if possible, and learn the lesson. Mistakes can happen to anyone, but every slip is a learning experience. As for that Cary Grant quote at the beginning, it checks out. The Oxford Dictionary of American Quotations by Hugh Rawson and Margaret Miner includes it and I managed to track it back to a 1964 news article by James Bacon who interviewed the actor and later wrote a biography. Featured image credit: the book shop by bill lapp. CC BY 2.0 via Flickr. Edwin L. Battistella teaches linguistics and writing at Southern Oregon University in Ashland, where he has served as a dean and as interim provost. He is the author of Do You Make These Mistakes in English? 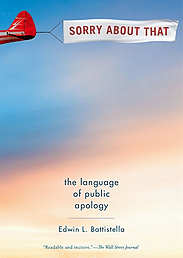 (OUP, 2009), Bad Language (OUP, 2005), and The Logic of Markedness (OUP, 1996). Excellent guidance. I’d add to “Learn what needs checking” that even those things that are familiar from what you’ve learnt still needs to be revisited.